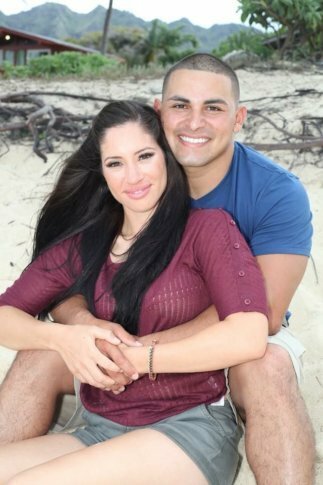 Thirty-year-old Kevin Rodriguez, an active duty Marine, will run his first marathon alongside his wife Susanna. But training for the 43rd Marine Corps Marathon has fallen on the back burner as they have been helping their Jacksonville, North Carolina, neighbors pick up the pieces from Florence's destruction. WASHINGTON — The 43rd Marine Corps Marathon will be the first marathon that 30-year-old Kevin Rodriguez, an active duty Marine, will run in his life. It’ll also be the Corpus Christi, Texas, native’s first trip to the nation’s capital. But amid all that excitement, one could probably forgive him if he doesn’t run quite as well as he had originally hoped, since training for the race has fallen somewhat on his list of priorities. Rodriguez is stationed at Camp Lejeune, in North Carolina, and Hurricane Florence made landfall only about 50 miles south of his home in the nearby city of Jacksonville. Susanna Rodriguez used to be an active duty Marine, too. In fact, that’s how the two met; and it’s why they chose to run this race together. Susanna retired from active duty about 1 1/2 years ago so she could be at home to help raise their three children. Kevin said parenting, work as active duty military, trying to take college classes and general home life was a balancing act in which Kevin felt they weren’t spending as much time with the kids as they both would have hoped. In fact, Kevin admits that even beyond planting the seeds for his family, “it’s really given me a lot of opportunities, and it’s opened up a lot of doors for things that wouldn’t have been available,” things, he said, he has greater appreciation for. But at the same time, having a spouse who was also in the military means being with someone who understands what he’s going through at work. And having been at home with their kids, he understands why she’s ready for a break when he gets home. It’s time Kevin hasn’t had much of lately. After the storm hit, he took leave so he could make the repairs he needed at his house, which suffered some water damage but escaped the worst. Kevin has been lending a hand to others still picking up the pieces. But the storm has shown him again how to appreciate what he has, much like deployments to the Middle East and orders to Japan have shown him in the past. He’ll never take a warm shower for granted again, for instance. His love of the Marines, his wife, and his life in general are why Kevin is running, and why Susanna is going to run with him — if not past him — in this race. The buildup to the race was one more way the Marine Corps was going to bring him closer to his wife. Now he’s hoping he’ll be able to stay close to her on the course.